I want to buy some cash. These banknotes are so cool, they are worth much more as collectibles. Is it legal to travel with a suitcase full of physical banknotes out of Venezuela? It's a really bad idea, so much that I registered just to warn you (I live in Venezuela). When there was a severe shortage of cash the government blamed it on banknotes being extracted through the Colombian border for sale at a profit and "hoarding". Arrests were highly publicized, which additionally helped support the conspiracy theory of an "economic war" waged from abroad to destabilize the country. Los tres hombres se desplazaban en dos vehículos por la carretera nacional San Félix-Upata. Los cuerpos de seguridad, en un trabajo de inteligencia, frustraron el presunto contrabando de extracción de esta cantidad de papel moneda. The three men were traveling on two vehicles down the San Félix-Upata highway. 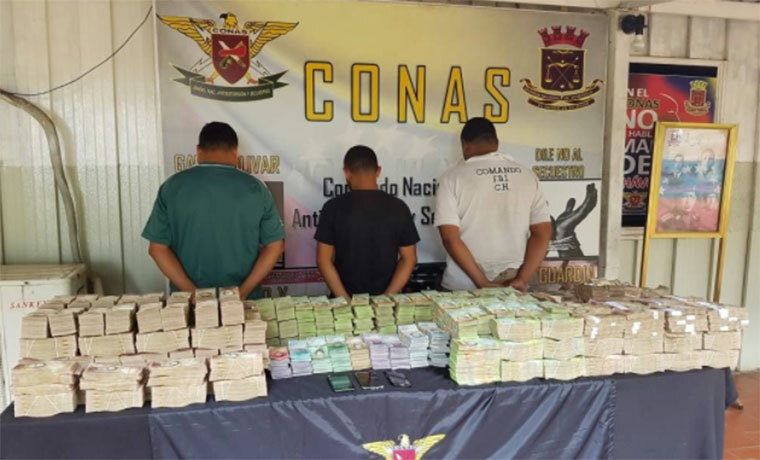 Security forces, in an intelligence operation, frustrated the presumed extraction contraband of these many banknotes. In a good scenario, you'll spend a few hours in "the little room" and be relieved of your valuables by the local authorities before they let you go. I agree that the banknotes are pretty, but please take just a few of each denomination. If anyone asks, it's left over from your daily purchases. General advice: don't come without a trusted local friend willing to accompany you everywhere, preferably in a car. I'm not exaggerating: Caracas has the 2nd-4th highest murder rate in the world, and $100 can feed a family of four for a month. There are official no-go "peace zones" for law enforcement where kidnappers take their hostages. 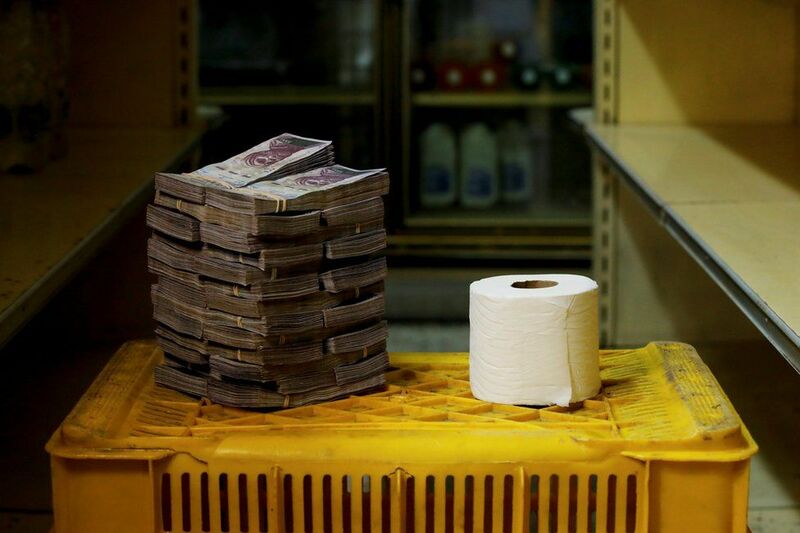 BTW, the photo in your question illustrates the amount of cash you needed to buy that toilet paper roll before the Bolívar was redefined so amounts would have 5 less figures (1 new "Bolívares Soberanos" = 100,000 old "Bolívares Fuertes"). MastaBaba's answer addressed the legality of exporting currency. This answer deals with importing currency. Most times you have to declare currency that you are bringing in. The limits vary. The USA says you have to declare more than the equivalent of US$10,000, for example. The first problem is that a border agent seeing your suitcase of cash won’t know how much it’s worth and whether it’s over the limit. They might be forced to count it all even if you’re under the limit in order to file a report, which will delay you considerably. You might miss your connecting flight. The second issue is that most paper currency has trace amounts of drugs on it. So large amounts of cash tend to get flagged by the drug sniffing dogs. So again expect delays and having to make explanations when this happens. Finally, in the USA, large amounts of cash have often been seized by state and local governments under the doctrine of civil forfeiture. If you are driving around with a suitcase of cash and get pulled over and a drug sniffing dog finds the cash, you may find it seized by the local police and you have to defend the cash against the seizure in a local court. TLDR: I hope you’re not bringing the suitcase of cash to the USA. This is a big no-no, don't do it! You would be going directly to jail, as currently any person with a lot of money in cash is a target. Venezuela has a multi-tier exchange rate. According to xe.com the official exchange rate is 9.9875 VEF/USD as of May 2017. The black market rate is approximately 80,000 VEF/USD so anything over a US dollar or two at the black market rate will exceed $10K USD at the official rate. So better to proactively declare the currency at customs on entry unless the official rate is updated to something more realistic. I would be a bit concerned about changing regulations on the export of currency. In my experience, countries with capital controls tend to be sensitive about import and export of currency. For example Taiwan did not allow import and export of their currency, though they stopped short of actually inspecting wallets. First: no restriction on currency export. So you can depart with any amount of Bolivares. Second: most countries do not enforce a limit of import, but a limit on how much currency to import silently, without obligation to declare. Those limits are always defined in the destination country's local currency, e.g. 10K $ or €. Considering that the Bolivar is a hyper-inflated currency and that the picture clearly displays (qualitatively, not quantitatively) how worth is that currency. No offense to Venezuelans. Then: in general, it's not illegal to bring cash abroad. You may move any amount of money as soon as you stop at customs and state "I want to declare cash". They will have you fill forms at very minimum. Europe does not apply taxes to declared currency. Conclusion: a suitcase full of Venezuelan cash, is mostly legal, at least in major destinations. Please state your destination to let me modify the answer accordingly. I don't know how big should a suitcase be to fit 10K€ equivalent of Bolivares. If the countervalue is below 10K€, you can proceed to the green area. In case you are stopped, you will be let go after counting the cash. If the total value exceeds 10K€ you are required to stop and declare. Caveat: expect questions. Custom officers pick up people at random. Expect them to count the bills until it is proven that you are below the legal limit. They will start from assuming you are trafficking cash. You may want to volunteer for an inspection to ensure trust. This will cost you time. Caveat 2: dogs are trained, and excellently effective, at detecting cash too more than drugs. Another reason to hail to a customs officer and volunteer. Not the answer you're looking for? Browse other questions tagged legal money venezuela or ask your own question. How to safely transport money?